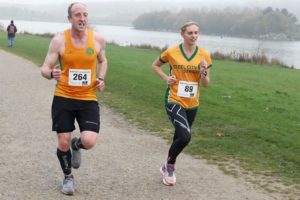 The inaugural Rother Valley Running Festival saw runners descend on this well-known local training spot and, of course, Parkrun. With a 10K/Half/Full and Ultra (!) on offer over the two days, this, by my math made for 1,874 laps completed by all finishers. Being my “home” Parkrun the course shouldn’t have come as any surprise, but it was surprisingly jarring starting at a different point and going anticlockwise compared to the usual. Although obviously not run on roads the park wasn’t shut to the public with quite a few dog walkers looking a bit surprised and scared as a field of runners descended on them. All this combined with my signature far too fast start made for quite a mentally taxing 2nd lap of trying to hold on grimly while dodging errant spaniels. The Marathon was won by Jonathan of Walton Leeds City Athletic Club in 2:34:59 and first Lady was the unattached Melanie Staley in 3:19:49. No Striders felt like taking on the Marathon! Last but not least the Ultra was won by unattached Dean Thompson in 3:53:22 with no Ladies or Striders taking part.